On October 27, 2010, a computer failure emerged at the FE Warren Air force Base in Wyoming. "Mr President we've lost control of FIFTY nuclear warheads"
"Pentagon chiefs were stunned to discover that a U.S. air force base had lost control of 50 nuclear, inter-continental missiles. As multiple error codes appeared on the computer control system at FE Warren Air Force Base in Wyoming, the Minuteman III missiles went into ‘LF Down’ status, which meant that officers were unable to communicate with them. Defense officials insisted yesterday there was never any danger of an accidental launch. 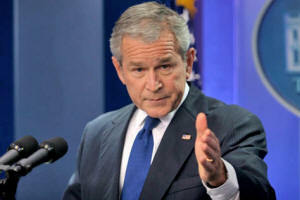 But the incident was deemed serious enough for Barack Obama to be briefed on it later. "causing a loss of communication with the missiles". This is not the first time there is a "glitch" in the control over America's nuclear arsenal. Invariably, these failures are not reported. A far more serious incident emerged in August 2007. As documented by CRG Research Associate Mahdi Darius Nazemroaya, several nuclear warheads actually disappeared. This was not a computer glitch. It was something far more serious. "There is a rigorous, almost inflexible, chain of command in regards to the handling of nuclear weapons". Why then did these nuclear warheads go missing? Nazemroaya's research suggests that "unauthorized removal" of nuclear warheads is an impossibility unless the chain of command is bypassed, "involving the deliberate tampering of the paperwork and tracking procedures." The incident went virtually unreported and was casually categorized by the media as "negligence". See below, Mahdi Darius Nazemroaya's detailed analysis, published in October 2007, on how these nukes went missing. The story was first reported by the Military Times, after military servicemen leaked the story. It is also worth noting that on August 27, 2007, just days before the "lost" nukes incident, three B-52 Bombers were performing special missions under the direct authorization of General Moseley, the Chief of Staff of the U.S. Air Force. The exercise was reported as being an aerial information and image gathering mission. The base at Minot is also home of the 91st Space Wings, a unit under the command of Air Force Space Command (AFSPC). According to official reports, the U.S. Air Force pilots did not know that they were carrying weapons of mass destruction (WMDs). Once in Louisiana, they also left the nuclear weapons unsecured on the runway for several hours. The lax security was not the result of procedural negligence within the U.S. Air Force, but rather the consequence of a deliberate tampering of these procedures. If a soldier, marine, airman, or sailor were even to be issued a rifle and rifle magazine - weaponry of a far lesser significance, danger, and cost - there is a strict signing and accountability process that involves a chain of command and paperwork. This is part of the set of military checks and balances used by all the services within the U.S. Armed Forces. Military servicemen qualified to speak on the subject will confirm that there is a stringent nuclear weapons handling procedure. There is a rigorous, almost inflexible, chain of command in regards to the handling of nuclear weapons and not just any soldier, sailor, airman, or marine is allowed to handle nuclear weapons. Only servicemen specialized in specific handling and loading procedures, are perm certified to handle, access and load nuclear warheads. Every service personnel that moves or even touches these weapons must sign a tracking paper and has total accountability for their movement. There is good reason for the paperwork behind moving these weapons. The military officers that order the movement of nuclear weapons, including base commanders, must also fill out paper forms. The strategic bombers that carried the nuclear weapons also could not fly with their loaded nuclear weaponry without the authorization of senior military officials and the base commander. The go-ahead authorization of senior military officials must be transmitted to the servicemen that upload the nuclear weapons. Without this authorization no flights can take place. Who gave the order to arm the W80-1 thermonuclear warheads on the AGM-129 Advanced Cruise Missiles (ACMs)? At what level in the military hierarchy did this order originate? How was the order transmitted down the command chain? If this was not a procedural error, what was the underlying military-political objective sought by those who gave the orders? Stormer unwraps the whole Pentagon cover-up by pointing out some logical facts and military procedures. This last point raises the question of what were the nuclear weapons meant for? Why, and for what ostensible purpose, were these nuclear weapons taken to Barksdale? How long was it before the error was discovered? How many mistakes and errors were made, and how many needed to be made, for this to happen? How many and which security protocols were overlooked? How many and which safety procedures were bypassed or ignored? How many other nuclear command and control non-observations of procedure have there been? What is Congress going to do to better oversee U.S. nuclear command and control? How does this incident relate to concern for reliability of control over nuclear weapons and nuclear materials in Russia, Pakistan and elsewhere? Does the Bush administration, as some news reports suggest, have plans to attack Iran with nuclear weapons? It is also being claimed that military teams in both U.S.A.F. 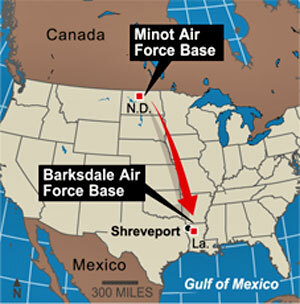 Base Minot and U.S.A.F. Base Barksdale made major "procedural errors". What are the probabilities of this occurring simultaneously in two locations? It is also worth noting that original reports from military sources talked about only five of the six nuclear warheads from Minot being accounted for in Barksdale. Nuclear warheads are also kept in specialized storage areas or bunkers. Moreover, nuclear weapons are not being decommissioned at Barksdale. The Role of the Nuclear Weapons Surety Program - What happened to Electronic Monitoring? The Nuclear Weapons Surety Program is a joint program between the U.S. Department of Defense and the U.S. Department of Energy. The National Security Agency (NSA) is also involved as well as other U.S. federal government agencies. The Nuclear Weapons System Safety Program is part of this program, which involves a monitoring and safeguards regime for the U.S. nuclear arsenal. “Command and Control” or “C2” involves the Office of the President of the United States of America. C2 is an established line of command, which is tied to the White House. Without it, nuclear weapons cannot be deployed or armed as they were in U.S.A.F. Base Minot. In addition to the checks and balances in place in regards to handling nuclear weapons, the Defense Threat Reduction Agency (DTRA) and its partners manually and electronically inspect and monitor all U.S. nuclear weapons through the Nuclear Weapon Status Information Systems. This is where the chain of command in regards to military officers falls into play. If any of the stocked inventories of nuclear weapons are moved to an authorized location they will be noticed and tracked by the DTRA and will require the relevant authorization. There is also a code system involved that is tied to the chain of command. The fact that the incident only apparently became known to the U.S. Air Force when military personnel reported it, suggests that either the nuclear weapons were ordered to be moved or that the electronic tracking devices had been removed or tampered with. This scenario would need the involvement of individuals with expertise in military electronics or for those responsible for the monitoring of nuclear weapons to look the other way or both. Several military personnel died under mysterious circumstances shortly before and after the incident. There are now questions regarding the fate of these individuals in the U.S. Air Force who could have had relationships in one way or another to the incident or possibly have been directly involved. It is also necessary to state that there is no proof that these deaths are linked to the August flight from Minot to Barksdale in question. Citizens for Legitimate Government has pointed towards the involvement of the U.S. Air Force in a cover-up and has linked several deaths of U.S. servicemen to the incident. Blue died under questionable timing while on leave, visiting his family in Wytheville, Virginia at the age of 20 on September 10, 2007. 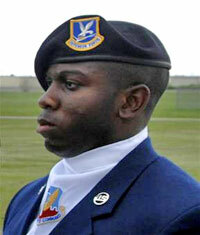 He was a response force member assigned to the 5th Security Forces Squadron. At Minot U.S.A.F. Base the 5th Security Forces Squadron to which he belonged was responsible for base entry requirements and a particular section, the Weapons System Security section, was responsible for preventing the unauthorized removal of military property. The latter is responsible for security of all priority resources, meaning the security of nuclear weapons. In other words not only did the 5th Security Forces Squadron keep eyes on what entered and left Minot, but they kept an eye on and monitored the nuclear weapons. U.S. Air Force Captain John Frueh is another serviceman who could have been indirectly connected to the “lost” nuclear weapons. He was reported as being last seen with a GPS device, camera, and camcorder being carried with him in a backpack. Local police in Oregon and the F.B.I. seemed to be looking for him for days. His family also felt that something bad had happened to him. 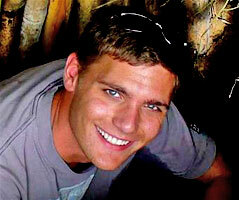 The last time he spoke with his family was August 30, 2007. He had arrived from Florida to attend a wedding that he never showed up at. He was also a major-select candidate, which means he was selected for a promotion as a U.S. Air Force major, but was not officially promoted. Captain Frueh belonged to the U.S.A.F. Special Operations Command. U.S.A.F. Special Operations Command has its headquarters in Hurlburt Field, Florida and is one of nine major Air Force commands. It is also the U.S. Air Force’s component of U.S. Special Operations Command, a unified command located at MacDill Air Force Base, which is also in Florida. The force provides special operations forces for worldwide deployment and assignment to regional unified commands, such as CENTCOM. Its missions include conduct of global special operations. These operations - and this is where careful attention should be paid - range from “precision application of firepower, such as nuclear weapons,” to infiltration, exfiltration (the removal of “devices,” supplies, spies, special agents, or units from enemy territory), re-supply and refuelling of special operational elements. In Captain Frueh’s case his death is questionable too. The U.S. Air Force would not let a missing persons’ investigation go forward by the police without conducting its own investigation. Usually the different service branches of the U.S. military would investigate for missing servicemen, to see if these individuals are Absent Without Authorized Leave (AWAL) or have deserted, before an individual’s case is handed over to the police. Another military weatherman, along with his wife, also died after August 30, 2007. The death of Barrs was reported as being part of a single-vehicle car accident. Barrs was pronounced dead on the scene of the accident, while Garrett was taken the hospital with no updates released by the U.S. Air Force. 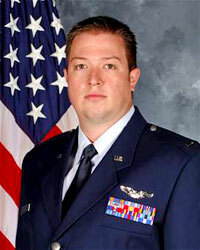 Adam Barrs also belonged to the 5th Aircraft Maintenance Squadron, where he was responsible for the maintenance and securing of the electronic communicational and navigation mission systems aboard the B-52H Stratofortresses on base. The 5th Aircraft Maintenance Squadron is also one of the units that are responsible for loading and unloading weaponry onto the B-52H Stratofortresses. The deaths of Kissel and Barrs could be dismissed as irrelevant because they occurred prior to the incident. However, Barrs and Kissel could have been in one way or another connected to the advanced planning of the special operation, prior to the incident (special operations are not planned in a few days and may take months and even longer). There is, of course, no proof and only an independent investigation will be able to reveal whether these deaths are connected to the incident. If there was an internal and secretive operation bypassing most military personnel, a few men in key positions would have to have been involved over a period of time prior to the August 29/30, 2007 flight. Senior Airman Barrs, due to his expertise in communication and navigational systems, could potentially have been involved in the preparations that would have allowed the nuclear weapons to escape detection by military surveillance and be ready for takeoff. 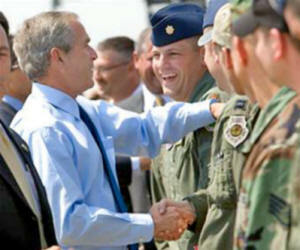 According to the Military Times, George W. Bush Jr. had been swiftly informed. This is a lockstep procedure. This illustrates the importance tied to the authorization needed for handling nuclear weapons. This is part of a two-way process in regards to authorization from the White House. The commander of the 5th Munitions Squadron and the commander of the 5th Bomb Wing, Colonel Bruce Emig, have been replaced along with a series of other senior officers. This implies that the U.S. Air Force chain of command is directly involved in this event. None of these senior officers have been authorized to speak or make statements, according to U.S. military sources. Will any of these officers receive lucrative departure packages? There are several important issues regarding the senior officers’ chain of command at Minot, which will be addressed in this article. Who gave the orders and authorization for the operation and what where the underlying objectives of loading armed nuclear missiles? 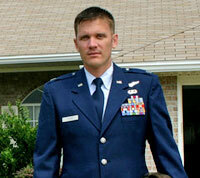 Riechers was a retired Air Force officer and master navigator specializing in electronic warfare. 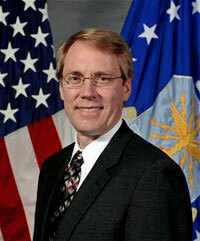 He was a member of the Senior Executive Service of the U.S. Air Force, and was the Principal Deputy Assistant Secretary of the Air Force for Acquisition and Management. The Washington Post reported that the Air Force had asked defense contractor, Commonwealth Research Institute (C.R.I. ), to give him a job with no known duties while he waited for official clearance for his promoted rank in the Pentagon. A mysterious suicide letter expressing shame was subsequently reported; the letter was reportedly from a man who had already admitted without shame that he was receiving money for doing nothing. This was known to the U.S. Senate, which had approved his promotion. The Commonwealth Research Institute (CRI), a registered non-profit organization is a subsidiary of Concurrent Technologies, which is registered with the IRS as a tax-exempt charity, which is run by Daniel Richard DeVos. Devos is also an associate of John P. Murtha, who was investigated by the F.B.I. for his Saudi links. Certainly the ties of the Commonwealth Research Institute (CRI), a non-profit organization working for the Pentagon, are questionable and the organization could be a front for internal operations that bypass most military personnel. The case appears to be part of an internal operation that was being kept a secret from most of the U.S. military, but what for? He once was one of the most senior individuals responsible for the nuclear arsenal of the U.S. military and also the former commander of Strategic Air Command (SAC) and director of the Joint Strategic Target Planning Staff, which identified nuclear targets worldwide amongst its responsibilities. Russell Dougherty in the course of his military career in the U.S. Air Force had dealt with the issues pertaining to Mutual Assured Destruction (MAD), full spectrum dominance, how to defeat the enemy and avoid a nuclear war, other uses for nuclear weaponry, Nuclear Primacy for the U.S., and tackling the effects of the wind and weather - due to their unpredictable natures - on the use of nuclear weapons. Several of the commanding officers at Minot were freshly appointed in June, 2007. This may have been part of standard procedures, but the timing should not be ignored. Colonel Cynthia M. Lundell, the now-former group commander for the 5th Maintenance Group, the unit responsible for loading and unloading weaponry onto the B-52H Stratofortresses was also freshly transferred from a NATO post in Western Europe in June, 2007. Were any of these appointments related to the six “lost” nuclear missiles? Senator Patrick Roberts of Kansas was also present. The same report also indicates that the U.S. President was in Wichita for a political fundraiser, and stopped at a new Boys and Girls Club of America to defray the costs of getting to Wichita via Air Force One for Senator Roberts’ campaign. Nothing has been reported about any private meetings between President Bush Jr. or any of his presidential staff and the personnel from Minot. However, reports have been made of meetings between military families and the U.S. President in his office on Air Force One. If a secret mission was being prepared, these events could have played a role in the recruiting phases for an important internal special operation. Following their recruitment, Minot servicemen could have symbolically met General Moseley or White House officials to understand that the mission was being sanctioned by the highest ranks and offices in the United States. 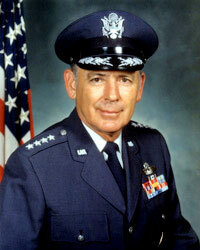 The post given to Riechers was politically motivated, given his track record in the U.S. Air Force. Riechers had been in a position of responsibility in the U.S. Air Force special operational support activities; something he had in common with Russell Dougherty, the former SAC commander. He would have been one of the best suited individuals for making arrangements in the case of an alternative command structure for a secretive nuclear operation. Moreover, he already had a record of corrupt behavior through his involvement with the Commonwealth Research Institute. Once again, the “C2” process involves the Office of the President and Commander-in-Chief. It is an established line of command, without which nuclear weapons could not have been deployed or armed as they were in U.S.A.F. Base Minot. If they on the grounds of loyalty to their country, the United States of America, come forward and reveal what has taken place, they are to be saluted with full honor by all ranks. “In a time of universal deceit, telling the truth becomes a revolutionary act,” and indeed these are deceitful times. The fact that U.S. Air Force officers came forward and reported this incident is contrary to U.S. military procedures, regulations, and laws. The U.S. military will never release any information that will risk or damage its reputation. Any information in regards to nuclear weapons can not be released without prior consultations with and authorization by the White House. What exactly were they meant for? Were they part of a war agenda or something else? In the U.S., under the Vigilant Shield 2008 war games (initiated in September, 2007) and the TOPOFF anti-terrorism exercises, some form of nuclear terrorist attack on American soil had been envisaged. Under Vigilant Shield 2007, held in 2006, the possibility of a nuclear war with Iran’s allies, Russia and China, had been contemplated in the war games scenario. The Kremlin has responded by holding its own war games. The six nuclear warheads were not meant for use in theatre operations against Iran. This is obvious because if they were then they would have been deployed via the proper procedural routes without the need to hide anything. Besides, there are already theatre-level nuclear weapons ready and armed in Europe and the Middle East for any possible Middle Eastern mission. There was something more to the incident. In regards to the case of the missing nuclear weapons, weathermen and military personnel with an expertise in space and missile components were involved. The incident took place during a time when the U.S. missile shield projects in Eastern Europe and Eastern Asia, directed against Russia and China, were raising international tensions and alarms. Nuclear warfare, the militarization of space, and “the missile shield” are interrelated military processes. The militarization of space is also deeply linked to this military project. Like their advanced knowledge about the U.S. missile shield project, Russian and Chinese officials have got wind of these ambitions and are fully aware of what the U.S. intends to do. The Nuclear Reactions Data Centers also estimated that the W80-1 stockpile included a total of 1,400 warheads remain in stockpile associated with the 900 ALCMs that are in storage with their warheads removed. Office of the Inspector General, U.S. Department of Defense (DoD), Year 2000 Status of the Defense Threat Reduction Agency Nuclear Weapon Information Tracking Systems, Report No. 99-235 (August 19, 1999). Michael Hoffman, Commander disciplined for nuclear mistake, Military Times, September 7, 2007. Mahdi Darius Nazemroaya, Vigilant Shield 2008: Terrorism, Air Defenses, and the Domestic Deployment of the US Military, Centre for Research on Globalization (CRG), October 6, 2007; Michel Chossoduvsky, Dangerous Crossroads: US Sponsored War Games, Centre for Research on Globalization (CRG), October 6, 2007; The March to War: NATO Preparing for War with Serbia? Centre for Research on Globalization (CRG), October 19, 2007. Secondly, as a fundamental natural law energy never disappears, it only changes or is transferred. 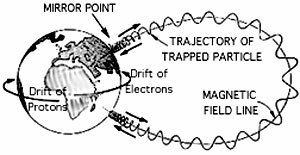 The energy from nuclear explosions can theoretically be transferred into the Earth’ magnetic radiation fields, called the Van Allen Belt or the Van Allen Belts, and used to energize and excite various particles, sub-atomic particles, and ions. Tentatively, if manipulated this can have harmful results on surface areas, including burning electronic and communication devices, and military applications such as disrupting satellites in space. If this were possible Russian, Chinese, Iranian, or Indian military defenses, communications, and missile facilities could be effortlessly neutralized. In fact the U.S. military has been experimenting with manipulating the radiation belts since the end of the Second World War. The U.S. Navy’s Project Argus, taking place from August to September 1958, is an example. A total of five nuclear weapons were used; three atom bombs (weapons using nuclear fission) were detonated above the Atlantic Ocean and two thermonuclear or hydrogen bombs (weapons using nuclear fusion) in the Pacific Ocean in an effort to manipulate the Van Allen Belts.